The Midwest Genetics Collaborative (MGN) unites patients, families, geneticists, genetic counselors, primary care providers, and public health experts from each of our seven states (Illinois, Indiana, Kentucky, Michigan, Minnesota, Ohio, Wisconsin) to link medically underserved populations to genetic services. Our work is guided by a core value of health equity which can be achieved only when every person has the opportunity to attain his or her full health potential. Health Equity – Oversee implementation of a regional strategy to ensure that health equity efforts are supported and culturally appropriate strategies to engage underserved populations are developed. Telegenetics – Develop a strategy to increase the use of telegenetics by providing trainings for clinicians, facilitating learning communities, and developing an online training geared toward patients and their families. Provider Education – Develop MOC4 modules to improve provider adherence to genetic clinical guidelines. Share the modules with AAP chapters across the MGN states, other RGNs and the NCC. Long-term Follow-up – The Long-Term Follow-Up Project will enrich existing data resources with long-term outcome data from diverse populations with inborn errors of metabolism (IBEM). 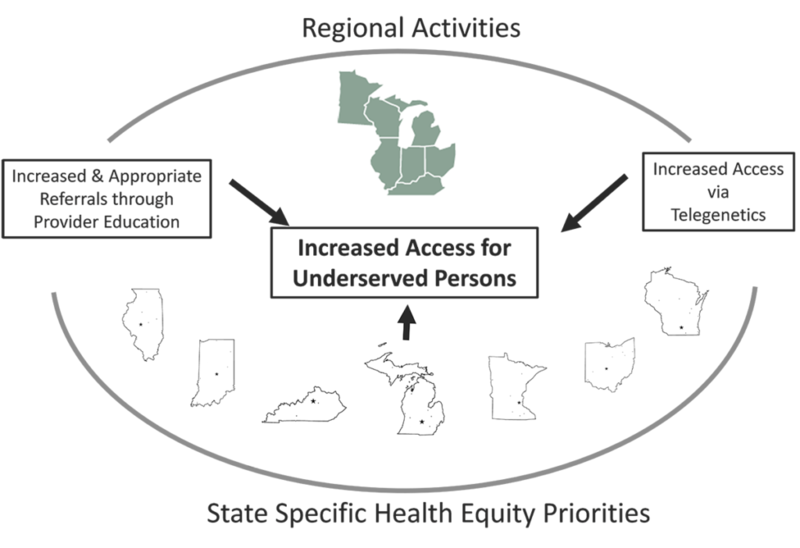 These four projects will result in both regional and state-specific strategies to improve access to genetic services for underserved patients as illustrated by the figure below. Our vision is to bring together the right people, at the right time, to achieve health equity for persons with genetic conditions across the Midwest.